Reporter A: My understanding of the process is, if any one party doesn't agree, it is an improperly rejected absentee ballot. The voter then gets a note explaining it so they can take further steps. On the ones that Coleman says we need to take a look at, if they're not going to get looked at, are those voters going to get that note; per your understanding. Mark Ritchie: There are 12,000 voters whose absentee ballots were rejected. There were 1,350 that the local election officials identified under the supreme court ordered procedure, our responsibility under that order, and under procedure is notification of those identified by the local election official. While the counties narrowed the list down, election officials still had work to do. Per the Supreme Court order, both campaigns and the county election representative are required to agree before a ballot can be marked for inclusion into the wrongfully rejected pile, in preparation for counting. At this point nobody knew how a given ballot was cast, they were simply deciding whether the outer envelope, immediately containing the ballot, should be opened and examined by election officials. In Hennepin County, Democrat Al Franken's campaign quickly blocked an attempt by Sen. Norm Coleman to add ballots to the 329 rejected absentee ballots county officials were ready to consider. So with no agreement, the two campaigns watched as county officials slowly went through each of the 329 ballots, starting with 38 ballots in Bloomington, the county's second largest city. After nearly an hour, the campaigns accepted 26 ballots from Bloomington and rejected 12 others. 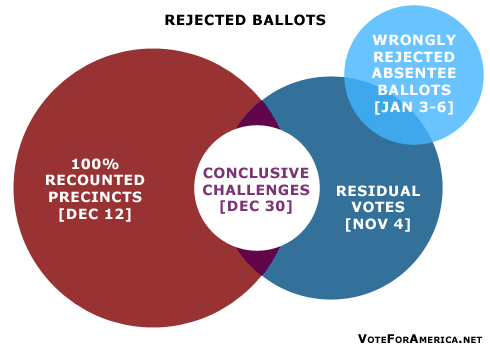 Of the 12 rejections, the Coleman campaign accounted for eight, and Franken blocked the other four. Upon completion of this agreement process, 955 ballots emerged in the wrongfully rejected pile awaiting to be counted. The counting process for these ballots worked exactly the same way as within previous phases of the recount; each campaign was allotted equal representation and were allowed to challenge the ruling of the election official. The challenges from the wrongfully rejected absentee ballots, if there are any, will be reviewed during Monday's meeting. At this point the election is essentially over, but the road may take a few additional turns. If you remember the quote earlier, by Mark Ritchie, the State of Minnesota is required by law to notify the 395 voters whose absentee ballots were initially identified in the 1,350 originally set aside by county election officials but were not included in the final 955. It is within a voter's legal right to challenge, in court, for the inclusion of their vote. It is possible, but not probable for those 395 votes to alter the current outcome pending the result of individual lawsuits. The Coleman campaign has acknowledged an additional 654 absentee ballots which they believe merit inclusion; the MN Supreme Court seems to disagree. The State will not be notifying voters who are identified within these 654 ballots. Norm Coleman has also signified his commitment to challenging the election result should he lose. The State Canvassing Board will meet tomorrow at 2:30 PM CT to tie up any lose ends and review any challenges. I'll have an update after the meeting adjourns around 5:30 PM CT depending upon traffic.